Two cinematic family guilt-fests  one with irony and a train, one with neither. Details: Directed by Terry George. Produced by A. Kitman Ho and Nick Wechsler. With Joaquin Phoenix, Mark Ruffalo, Jennifer Connelly, Mira Sorvino, and Eddie Alderson. Opening Friday in San Francisco. Directed by Wes Anderson. Produced by Anderson, Roman Coppola, Lydia Dean Pilcher, and Scott Rudin. With Adrien Brody, Owen Wilson, Jason Schwartzman, Amara Karan, Anjelica Huston, Bill Murray, and Natalie Portman. Opening Friday. As anyone who goes to a lot of movies knows, the American family is in tatters. Completely dysfunctional. Morally out of gas. Barely able to look at it itself in the mirror. So it leaves that collective self-examination to healer-filmmakers like Terry George and Wes Anderson, who know how to tease the inherent rottenness out of such seemingly mundane family interactions as grieving for a lost child, grieving for a ruined childhood, and grieving for, well, the hell of it. What did we do to deserve these grief-counselor filmmakers? They seem to think they can express something that we cannot, and they're so persistent. It's enough to make us want to run away from home. From the first moments of George's Reservation Road, we know we're heading for a crack-up. That kid, the violin prodigy who has just finished his recital, is too angelic to be real, and his parents, college professor Ethan Learner and his wife Grace (Joaquin Phoenix and Jennifer Connelly), both have that impending-disaster look on their faces. Sure enough, the young genius' life is snuffed out on the title Connecticut road en route home, by a character we first glimpse right after we meet the Learners, attorney Dwight Arno (Mark Ruffalo). Dwight and his eleven-year-old son, Lucas (Eddie Alderson), are shown in the stands at Fenway Park in Boston, staying late for an extra-innings Red Sox game, and Lucas' mother, Dwight's ex-wife, is on the cell phone complaining about the situation. So it's pretty hectic for Dwight as he's hurrying home in his SUV. He loses control and accidentally hits the Learner boy, who is releasing fireflies along the road while his family's car is stopped at a service station. We see the SUV slow down, hesitate, then abruptly speed away before anyone could identify it. Dwight has committed hit-and-run vehicular manslaughter. Young Josh was asleep at the time, and Dwight explains that he must have hit a deer or something. Thus the Learners enter their period of grief and eventual murderous rage at the same time Dwight adds a terrible guilt to his own load of family problems. Both Dwight and Ethan are wracked by a father's anguish over the fate of his child. The premise, by John Burnham Schwartz from his novel, is nothing revolutionary but has a solid character logic to it: two highly strung, guilt-laden fathers are on a collision course. The suffering is showy, but never showy enough. Phoenix' Ethan quietly seethes, while Ruffalo's Dwight mostly skulks around, clumsily hiding evidence. Dwight's career also happens to be a mess. Matters get worse when, in one of the movie's dubious coincidences, Ethan walks in and hires Dwight to investigate his son's death and counsel him, after the police have proved less than helpful. At home, Connelly has one or two scenes displaying Grace's dismay, but it all seems mechanical, by the numbers. Mira Sorvino, as Dwight's remarried ex, is wasted in a role that could have been played by a dress extra. So it boils down to the two men. Tension tries to build as we crosscut between them, but finally the coincidences, not to mention director George's (Hotel Rwanda) knack for dampening the actors' fire beneath a blanket of sluggish melancholy, distracts from the visceral revenge story we deserve to see. Reservation Road's dry dramatics derail the personal retribution plot in favor of something more general, something out of a sociology textbook. The actors, particularly Ruffalo, deserve better than the queasy preachiness we're left with. The arc of Wes Anderson's career is now clearly visible. He was warming up with Bottle Rocket, hit second gear with Rushmore, and peaked with The Royal Tenenbaums, his most accomplished effort. The Life Aquatic with Steve Zissou represented a dreadful sophomore slump. 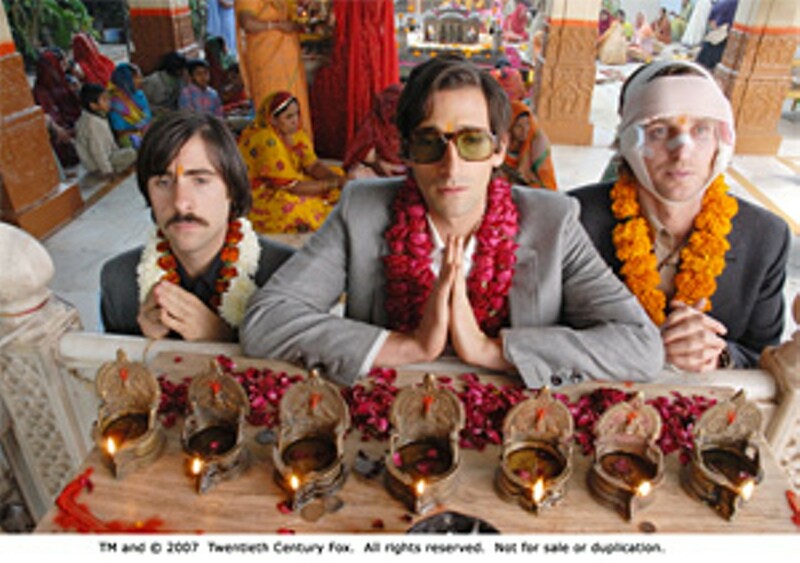 And now, with The Darjeeling Limited and its story of three brothers (Adrien Brody, Owen Wilson, and Jason Schwartzman) reuniting on a train ride through India, writer-director Anderson has entered his baroque period with yet another unhappy-family saga, this time set in a faraway place instead of Anderson's usual stateside emotional wasteland. But he manages to make the exotic Indian countryside seem like a suburb of Houston. The screenplay, by Anderson with Roman Coppola and actor Schwartzman, is his most fragile to date, a hash of "ironic" tics and half-finished confessionals, as if lightly riffing on the theme of disconnectedness could somehow make it feel better. Everything is so damned cute. The brightly colored Indian train, the camera angles, the brothers' odd business suits, the lovely and willing railroad stewardess (played by Amara Karan), Wilson's bandaged face, the inscrutable Sub-Continentals in general, the tchotchkes Anderson lovingly sprinkles in each and every frame. We're reminded of Richard Lester's '60s Beatles vehicles, except that Anderson is all about getting over the shock of adolescence instead of perpetuating the joy of youth. If Anderson insists on remaking the same movie again and again, he should at least find a few new actors. The mustachioed, expressionless Schwartzman grows increasingly tiresome, particularly in the accompanying Web-based short, Hotel Chevalier, in which he noodles around a Paris hotel room with Natalie Portman. Owen Wilson, veteran of four Anderson films and the subject of gossip columns in the wake of his recent suicide attempt, perhaps needs some time off the treadmill. The only brother with some depth is Brody's Peter, and even he gets entangled in the "tragic villagers" subplot, a naked bit of scenario padding that, for all its pathos, leads nowhere. But it's nice that Anjelica Huston (as the boys' mom, now a nun) and Bill Murray (in cameo as an unlucky traveler) are finding work. The Darjeeling Limited, the shaggiest of shaggy dogs, tarts up its non sequitur plot with lots of extraneous stuff, but there's no camouflaging its lazy predicaments and tired scenario.